C harlotte’s culinary scene has been busy in 2017 with brilliant new additions, revamped menus, anticipated openings (we’re still waiting for you, Hello, Sailor), and innovative concepts. Some aforementioned concepts have included a not-so-secret speak-easy where the food rivals the cocktails, a social club complete with food and bowling, Southern-focused cuisine, and a much-needed Italian spot from chef Luca Annunziata. But alas, there can be only one true “best” for 2017. We spent countless hours and calories trying new restaurants to find it. Our selection has a simple, yet elegant and comforting menu, incredible cocktails, impeccable service, and, after multiple visits, never disappoints. Charlotte’s best restaurant of 2017 is Haberdish. The fourth restaurant concept from restaurateur Jeff Tonidandel, whose other restaurants include Crepe Cellar Kitchen & Pub, Growlers Pourhouse, and Sea Level NC, Haberdish is a pre-Prohibition era-focused restaurant with a pharmacy/apothecary feel located in the heart of NoDa. Since opening in early 2017 (after a soft opening around the holidays), Haberdish elegantly combines history with nostalgia of a bygone era. They specialize in simple Southern dishes inspired by the food served in the mill town of North Charlotte (now known as NoDa) during the late 1800s and early 1900s. 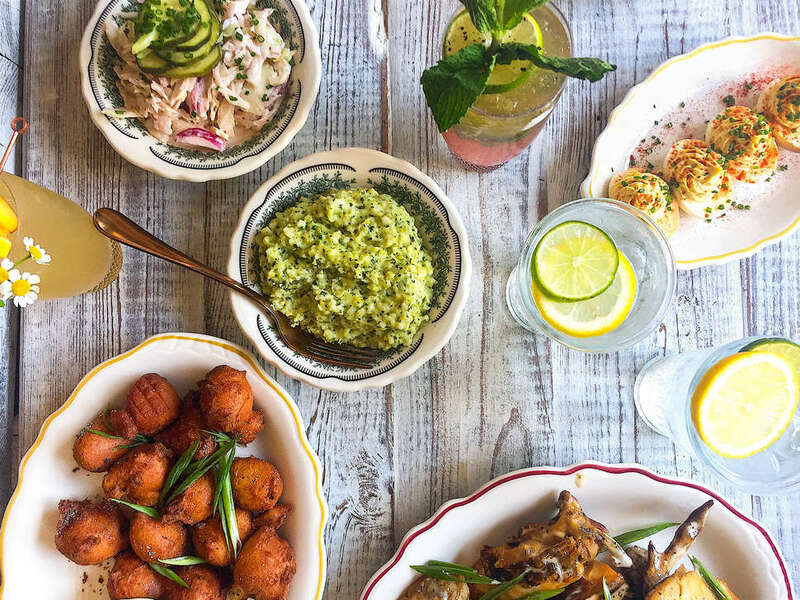 Food is pickled and fried, and the resulting dishes make you feel like you’re eating a family meal around grandma’s table. The theme of the mill town era doesn’t stop at the food. It’s carried out through the salvaged denim on the seats (denim produced in Cone Mills, North Carolina). The tabletops were handcrafted using wood that came from the rafters of the building where Haberdish is located, and the bar taps are reused spindles from a former mill. To explain our reasoning as to why Haberdish is the Charlotte restaurant of the year, we’re going to break it down between three categories: chicken, sides and snacks, and cocktails. Let’s begin. Brined, battered, and fried, the chicken at Haberdish can be ordered half ($14), whole ($23), or in two-piece white ($9.50) or dark ($7) meat options. They also offer chicken tenders for $2.50 if you’re not ready to commit to something bigger. Crisp and brown on the outside, the birds are consistently succulent on the inside, making for the perfect bite every time. And sure, there are other options for entrees, such as the cast iron NC trout, but you’re coming here for the chicken. And if you’re wondering where your food is coming from, the chickens come from Springer Mountain Farms and have never been exposed to antibiotics, animal by-products, growth stimulants, or hormones. 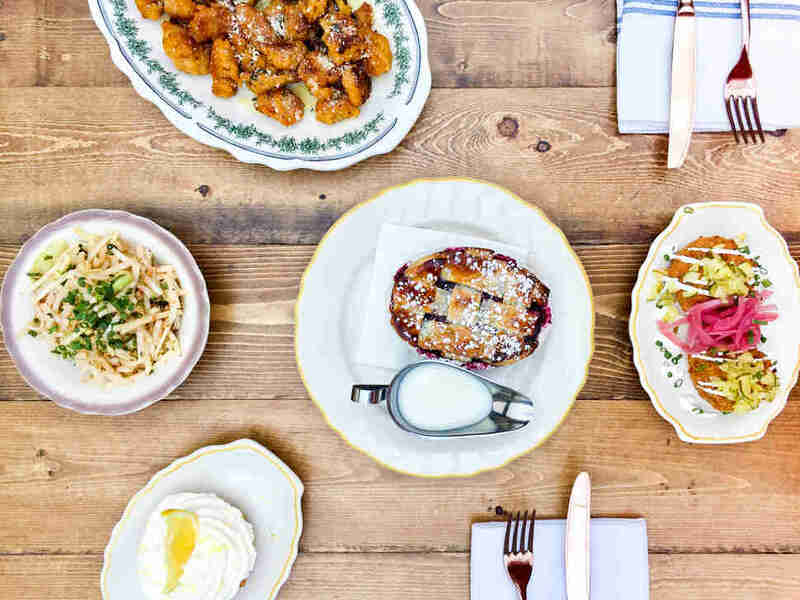 From house pickles to smoked deviled eggs and liver mush toast, the snacks portion of the menu doesn’t cut corners when it comes to satisfying even the most disparaging palates. Our favorite is the pimento cheese ball, which is rolled in spiced pecans (order this) and ranges from $4 to $9 based on size. Next up: sides. These are served in small or large portions which can be shared at the table, or you can make a meal out of them. Pro-tip: Order anything kale on the sides menu, just trust us… the kale salad and the kale grits are insane. We also highly recommend the mac & cheese, especially to compliment a heaping order of spicy chicken skins. Chicken may be the star of the show, but the cocktails are the entire supporting cast. Unsurprisingly, Colleen Hughes, who creates the beverage programs at all four of Tonidandel’s restaurants, is in charge of Haberdish’s as well. We should also note that we selected her as the Best Bartender of 2016. From spherical ice cubes encasing citrus and edible flowers to punches best shared with groups of friends and family members, Hughes' cocktails are certainly anything but boring. She's divided the cocktail menu into five parts: aperitifs, punch & refreshers, spirituous, after dinner, and digestives. The smoked mint julep and the house Old Fashioned are some of our favorite under the spirituous category, but for a taste of something you likely won’t find elsewhere, try one of the digestives. Many of the drinks contain fernet, a bitter, aromatic spirit. The taste is distinct and can take a couple of sips to get used to, but you’d be hard-pressed to find a better concoction in Charlotte. The drinks are seasonal, so you’ll see a rotating list of libations, but that just gives you more of an excuse to come back again. From a well-thought-out theme that carries over from the food and cocktails to the decor, Haberdish has never lost its stride since opening. It’s consistently producing the most mouthwatering chicken around, as well as simple sides that could legitimately double as entrees. The decision isn’t easy, but it sure is delicious. And that’s why Haberdish is our best new restaurant of 2017. Erin Maddrey enjoys writing about food, beverages, and all things Charlotte. Due to her love of these things, she can be frequently found at the gym. Follow her and her Charlotte adventures on Twitter and Instagram @ErinMaddrey.